You know you've got money problems, but you're so mired in just getting by that you may not have a grip on the big picture. Without this perspective, it can be difficult to know if you can pull yourself out of your money troubles on your own or if you need a legal intervention like Chapter 7 or Chapter 13 bankruptcy to help you get out of debt. Today, we'll share 10 signs that you may need to stop trying to muddle through and take a more serious step. 1. Have you had to take a second job or extra work shifts to pay your bills? If you can't get by on your regular earnings when you once could, this is a warning sign that your debt has grown out of control. Working extra shifts can exhaust you and takes away time with your family. Unloading debt can get you back to working a reasonable schedule. 2. Other than your student loans, car loan and mortgage, could you pay off all your debt within 12 months? If your debt has grown such that you're facing years and years of repayment and skyrocketing interest, this can be tough to face, especially if you have to work more than one job to do it. Unless you can pay off all your short-term debt (i.e. debt other than mortgage, car loan and student loans) within 12 months, you've got too much debt. 3. Do you use credit cards to pay for necessities? If you have to use plastic to pay for groceries, diapers, utilities and other necessities, you've got money problems serious enough to consider bankruptcy. 4. Are you making credit cards payments with other credit cards or are you taking cash advances? If you re robbing credit card Peter to pay credit card Paul, this is a sure sign that your money problems are out of control and need a serious intervention. 5. Are you paying only the minimum payment on your credit cards? If you're only paying minimum payments on your credit cards, your balances will keep piling up and it will take far too long to pay them off. If you can only afford the minimums, you need help. 6. Have you opened a new credit card account just to pay for expenses? If you're accepting every credit card offer you get because you need the additional credit lines to pay bills, buy groceries and necessities, you are in way over your head and need to take drastic steps. 7. Are you getting hit by late fees on your credit cards, car loan, mortgage and utilities? If you can't pay your bills on time, you'll get hit by late fees and interest. This can pile onto your debt and make it spiral out of control, often to the point where you can't catch up. 8. Have your utilities been shut off at least once in the past 12 months? Have you had your lights, water or gas shut off in the last year once, twice or is it a monthly battle to keep your house heated and lit? When utilities are paid late, utility compenies often charge a late fee and then you're charged another fee to reconnect. This is a costly consequence of not paying your bills on time. 9. Are you being sued by creditors or have you already been sued and are facing a lien? Bankruptcy can shut down these lawsuits and may be able to get rid of the liens associated with them. 10. Are you unaware of how much your total debts are? 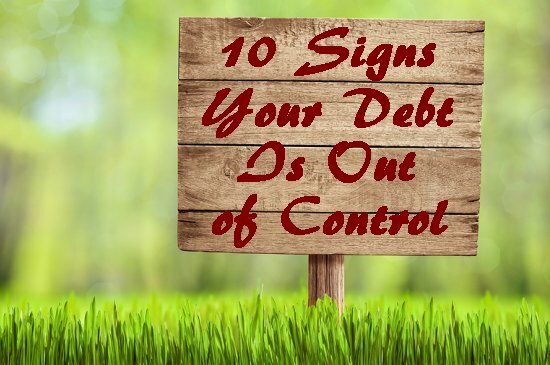 If you have no clue how much debt you're in but you do know that it's more than you can manage, that's not a good sign and definitely a warning that you need help to get your finances in order. If you're earning a high wage, you may still be able to qualify for a Chapter 7 bankruptcy depending on how extensive your debts are. However, if you have more assets than you can protect, a Chapter 13 may be a better way to go. If you're a medium or lower-income wage earner, a Chapter 7 may be the wiser course. To find out more which is best for you, contact the law offices of John T Orcutt for a free consultation with one of our North Carolina bankruptcy experts. Call us at 1-888-234-4181 and ask about our $0 down bankruptcy plans.